© Provided by AFP Scottish National Party leader Nicola Sturgeon has pledged to outline her plans for another independence referendum "when the terms of Brexit become clear"
Some 20,000 people marched through Edinburgh on Saturday calling for Scottish independence, officials said, less than six months before Britain's planned departure from the European Union. 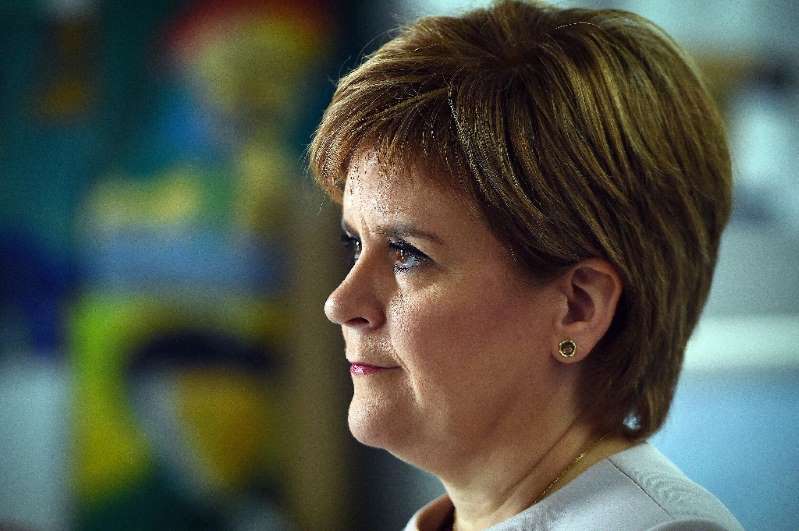 Scottish National Party (SNP) leader Nicola Sturgeon has pledged to outline her plans for another independence referendum "when the terms of Brexit become clear". An announcement was widely expected at the party's conference next week, but with Brexit negotiations between London and Brussels deadlocked she has warned she may delay her plans until later in the year. Voters in Scotland backed remaining in the EU by a significant margin in the 2016 referendum and Sturgeon has remained a vocal opponent. Prime Minister Theresa May has refused to permit another independence vote, which must be authorised by parliament in London, complicating Sturgeon's desire to stage a poll before Britain is due to leave the EU next March. Scottish police said in a statement that 20,000 people took part in Saturday's march, based on City of Edinburgh Council estimates. Pressure group EU Citizens for an Independent Scotland, who fear many Europeans will leave Scotland before they get a chance to vote for independence, were among those at the rally. Organiser Ellen Hofer, 31, from Germany, told AFP: "This Brexit situation is just despicable. "We can't stop Brexit, we can't help what is happening with the UK, but we can help with what we are doing here in this country with independence." Representatives from English Scots for Yes, a group set up to dispel the notion that Scottish nationalism is 'anti-English', were also present. "People who say that we're anti-English in some way are, quite frankly, ludicrously stupid," its national director Math Campbell, 31, originally from Cambridge, told AFP. "It's not about nationalities, it's not about where we were born, it's about where we're all going together as a country." Nationalists gathered in Holyrood Park in the shadow of the devolved parliament, defying a warning from local authorities that the rally was unauthorised. Historic Environment Scotland, the custodian of Scotland's parks, refused to issue a permit for the rally, insisting it does not allow demonstrations of a political nature. However, organisers were emboldened when Police Scotland said they would only enforce public order laws prohibiting unlawful gatherings if safety was at risk. A small counter protest featuring union flags on the city's Royal Mile led by A Force For Good, British unionist organisation, was drowned out by thousands of nationalists waving the Saltire, the flag of Scotland.